Choosing a printer these days can be a daunting task. There are literally thousands of makes and models to choose from. Here are some important points you should consider, but if you’re still in doubt then don’t hesitate to call your nearest Cartridge Green store for some really useful advice. Before you buy a printer, you should consider the following points and if you are still in doubt then don’t hesitate to call your nearest Cartridge Green store for some really useful free advice. How much do the cartridges cost? This should be the very first question you ask about the printer you are considering purchasing. Finding out after you have bought the printer is too late and literally thousands of our customers have found out to their detriment! Generally speaking, printers that are free or cheap to buy use cartridges that are very expensive to replace so ask before you buy. 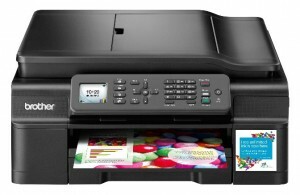 Most inkjet printers today are multi function. They include a scanner, copier, colour and black printing, card readers, Pictbridge and photo printing up to A4 size. Additional functionality can include printing photos directly from your phone or tablet, A3 photo printing, fax, auto page feeders, colour LCD display screens, touch screens and much more. You will pay a lot more for this additional functionality that may not be necessary for your needs. You should decide what you want and stick to it. Avoid fancy gadgetry as you won’t use or need it but you will pay for it! If you really want to save money then this is the most important thing to know as it will drastically reduce your printing costs. Many printers are sold with “single use” cartridges that cannot be refilled. To find out if they can be refilled just call any of our stores with the cartridge/printer model and they’ll tell you straight away and advise you what printer will suit your needs best. How many pages do the cartridges print? Any good printer vendor should be able to tell you what is known as the page yield of a cartridge. This is an industry standard and it is the number of pages the cartridge will print based on a 5% page coverage. A 5% coverage is approximately the amount of text in an average one page A4 letter. The page yields vary hugely between makes so make sure to ask or contact us and we’ll tell you. How much does it cost to print a page? By dividing the cartridge cost by its expected page yield you can calculate how much each page will cost you to print. This gives you the true figure of how expensive a printer costs to run. 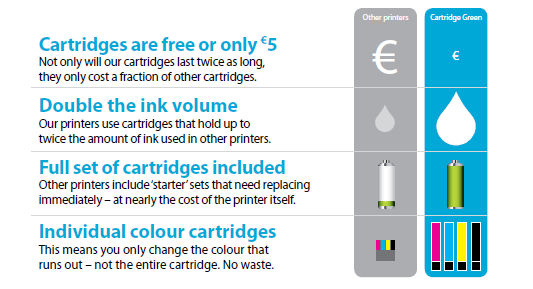 For inkjet printers anything above 5 cent per black page should be considered too expensive. How much you print will dictate what type of printer you need. If you print more than 500 pages a month then you should consider buying an entry level laser printer instead of an inkjet printer. Although the cartridge(s) may be more expensive, their page yields generally start at about 1,500 pages which brings the cost per page right down to around 2.5 to 5.0 cent per black page. If you print less than 500 pages per month then stick with the inkjet printers with a high yield cartridge.